Skin cancer is extremely common and often caused by years of sun exposure. Age is a factor as well. More than 5.4 million nonmelanoma cases are diagnosed in the U.S. each year. When detected early, it can be treated and often cured. The Skin Cancer Foundation and medical professionals recommend regular checkups by dermatologists as well as self-exams. With regular self-examinations, you can identify changes in your skin. Therefore, you can check existing freckles and moles for any changes. The entire process shouldn’t take more than 10 minutes. If you’re not sure how to conduct a self-exam, ask your doctor to show you. Asymmetry: Part of a mole looks different than the other. Border: It has ragged, irregular, notched, or blurred borders. Color: The lesion may feature different shades of brown, black, or even pink, red, white, or blue. Diameter: Spots larger than ¼ inch across (a pencil eraser) should be checked by a doctor. Evolving: Observed changes in size, shape, and color over time. Although not as dangerous as melanoma, basal and squamous cell carcinomas are more common and can be identified early. They usually form in areas that receive the most sun exposure, including the head, face, and neck, but may occur anywhere on the skin. Basal cell carcinomas may look pale or yellow; flat and firm lesions may look like scars, or they may appear as raised reddish patches that itch. Lesions may also appear translucent, shiny, or pearly; these bumps might have patches of black, blue, or brown. Sometimes, they manifest as pink growths that are lower in the center and raised at the edges; abnormal blood vessels may spread outward from the center. Open sores that don’t heal or come back may be signs of basal cell carcinoma, especially those that ooze or have crusting. Squamous cell carcinomas often look like crusted or bleeding rough/scaly patches, raised growths or lumps, or open sores. They may resemble wart-like growths as well. However, not all skin cancers fit these descriptions, so it’s important be on the alert for new spots, spots that look different from others on your skin, or sores that don’t heal. Moles that become red or swollen beyond their borders, or that start to itch, hurt, or become tender, should be shown to a doctor. A Body Map and Self-Examination Schedule can be downloaded from skincancer.org. It enables you to keep track of moles, freckles, birthmarks, bumps, scaly patches, and other spots. Note on the body map where each is, and indicate its size, color, and the year/month/day you examined it. 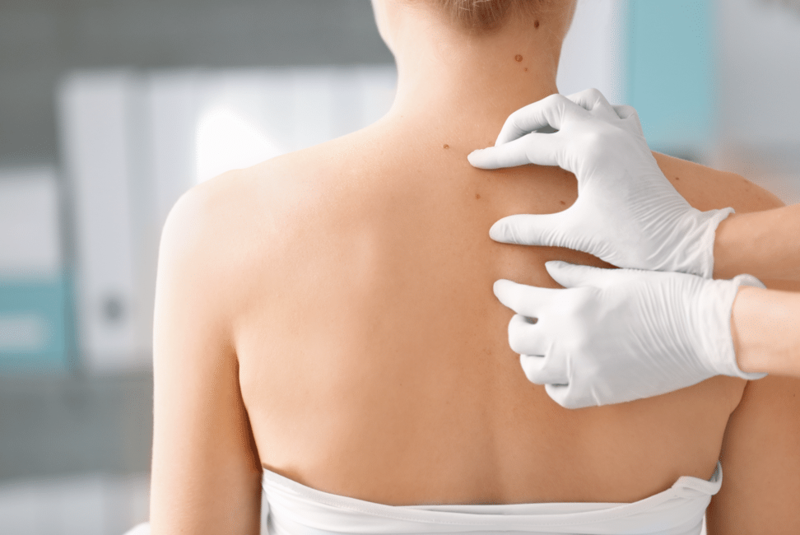 For each subsequent exam, find each corresponding spot and record any changes in size, color, or shape, as well as spots you hadn’t noticed before, to determine if you should see a skin cancer doctor in Los Angeles. Sun spots, moles, freckles, and other skin lesions can often be treated easily with lasers. At the Laser & Dermatology Institute of California, you can schedule an appointment at one of our three locations—LDI of Los Angeles, LDI of Newport Beach, or LDI of Covina. Call us or self-schedule online to set up a free consultation with one of the best skin care services in Southern California.